The report aggregates publicly available source material to arrive at a rough estimate of the cost of poor software quality in the United States today. This report fills a gap in our understanding of the financial implications of poor-quality software effecting society today and into the future. 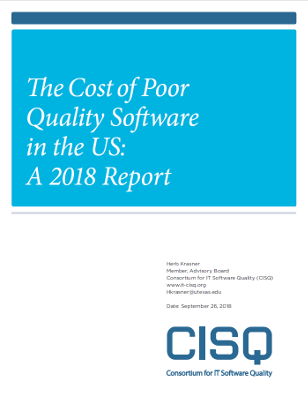 In summary, the cost of poor quality software in the US in 2018 is approximately $2.8 trillion, the main components of which are outlined in the body of the report. Software Ate My Homework Podcast: Will Our Software Bankrupt Us?